EMPAC welcomed delegates from police forces and universities across the East Midlands and beyond at last weeks launch event, where Programme Director, Supt. Dave Hill set out the international ambitions of the collaboration. Supt. Hill addressed the event hosted at the NSPCC’s National Training Centre in Leicester to explain how EMPAC intends to deliver 40 research projects, including 20 fellowship projects across five research networks, each focusing on a different area of policing. He made clear that, although the organisation will be based in the East Midlands, due to the wealth of professional and academic expertise the region boasts, the projects delivered by EMPAC should have both national and international influence in the long term. 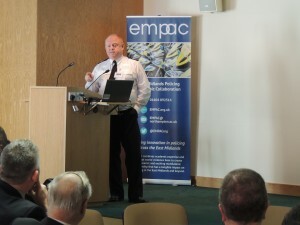 Attendees at the event were welcomed by Assistant Chief Constable Phil Kay of Leicestershire Police, who spoke passionately about the need to drive continuous improvement in policing and emphasised the similarities in academics’ and police professionals’ search for evidence in order to support their findings. Professor Simon Denny, Director of Research, Impact and Enterprise at the University of Northampton then spoke about the recent change in focus away from theoretical research towards ‘outcome-focused’ academia, which looks at the impact of findings on individuals and communities. Prof. Denny highlighted the opportunity afforded to EMPAC by this culture change. Rachel Tuffin from the College of Policing lead an interactive session on why ‘evidence-based policing’ is the right approach. She encouraged delegates to challenge traditional and conventional approaches to policing and assess how they might use the ‘best available evidence’ in day-to-day decision making processes. The final speaker was Supt. Dave Hill, who introduced the five areas of research: local and community policing; serious organised crime; organisational transformation; victims, witnesses and public protection; and operational policing. He also introduced the EMPAC website and called on network leads and police professionals to contribute to the growth of the websites ‘Learning Centre‘ with feedback and content. Delegates were then encouraged to engage with research network leads over a networking lunch to conclude the event. Supt. Hill said: “It was great to see representatives of police forces, PCC’s offices, and academic institutions from across the East Midlands at the launch of this important collaboration. It shows that there is a real support for the development of the evidence-base used by police within their organisations and in policing practices.